If you have big plans in mind for your Colorado home this summer, it is important to find the right professionals to get the job done properly. Deck installations, for example, are a big undertaking, and they require considerable knowledge and skill to ensure a safe and long-lasting outcome. Many homeowners across the Front Range have invested in outdoor living areas to make the most of their deck space and enhance the convenience and enjoyment. If you’re looking for a local decking company that creates optimal outdoor living spaces in Larimer County, the experts at Rocky Mountain Fence & Deck in Loveland are here to help! For years, our patio builders and fence contractors have worked to create amazing results for customers across the state, relying on proven practices to meet your high expectations. One upgrade we often talk about is the addition of a hot tub to your current deck design. Today, our deck contractors will continue to highlight the top considerations to discuss with your decking company when adding a hot tub. If you’re looking for expert assistance in customizing your outdoor living space, be sure to reach out to our team today! The material you utilize for your deck installation will play a large role in protecting your structure from problems such as rot and decay. Moisture is a natural enemy of man-made structures, and your deck is no exception. It helps to invest in the right material to ensure that your outdoor living area holds up beautifully over the years. Your material will also dictate maintenance demands, as some choices require much more upkeep for water protection. Hot tubs also create a higher percentage of bare feet running across your deck. Keep user safety in mind when selecting your decking material, as investing in an inferior product can create serious concerns later on! The hot tub, when empty, will generally hover close to 1,000 pounds. The water used to fill the tub comes out to roughly 8.5 pounds per gallon, adding an additional 3,000 to 3,500 pounds of weight. The hot tub occupants also place an increased load demand in one centralized area. If you have six people enjoying your outdoor living area, expect another 1,000 pounds! The total weight demands for a hot tub can be similar to that of a full-size pickup truck! It’s essential to plan ahead and develop a sound deck base to support the added weight of this feature. Our deck builders have experience creating a wide range of outdoor living spaces, relying on years of experience to ensure that you have a safe outcome for your Colorado home. Beyond the safety requirements including with high weight loads, your hot tub will also need to be installed correctly to ensure that users are safe at all times. Homeowners looking to add water — heated by electricity — to their wood decks have to plan for a safe and secure zone that takes precautions to minimize fire and electrocution hazards. An emergency shut-off should always be included nearby for optimal safety. We recommend placing it in a common space that is easy to reach in case of an emergency. Installing a larger hot tub will also create more electric demands, so be sure to speak with your deck builders for assistance! Rocky Mountain Fence & Deck is here to provide amazing outcomes for all of our clients, delivering personalized results to meet their goals. 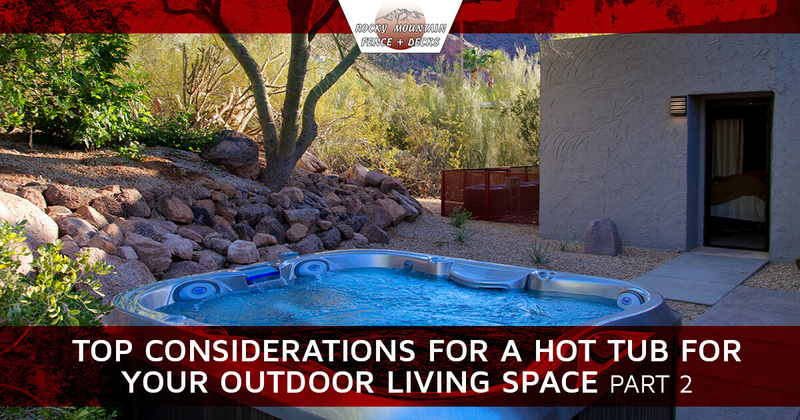 If you’re hoping to install a hot tub in your outdoor living space in Larimer County, then it is important to find a team that can provide the logistical support to get the job done safely and effectively. Contact us today to learn more or to schedule your consultation!